I had Christmas at work today! My colleague brought me a bagful of lovely old Lundby stuff, which he had found when he was cleaning the storage room of his family. 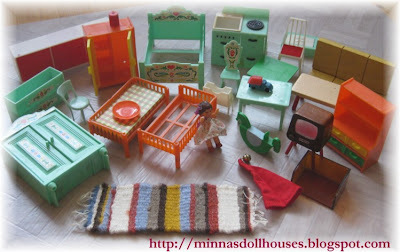 They are just the kind of things which I have been looking for, as I recently decided to start to decorate my 1:16 scale Lisa dollhouse with vintage furniture! Minulla oli tänään joulu töissä! Kollegani toi minulle pussillisen ihania vanhoja Lundby-tavaroita, jotka hän löysi siivotessaan perheensä varastoa. Nämä ovat juuri sellaisia tavaroita, joita olen yrittänyt löytää, sillä päätin äskettäin ruveta kalustamaan 1:16 mittakaavan Lisa-nukketaloani vanhoilla huonekaluilla! I haven't had an Ari doll this small before. 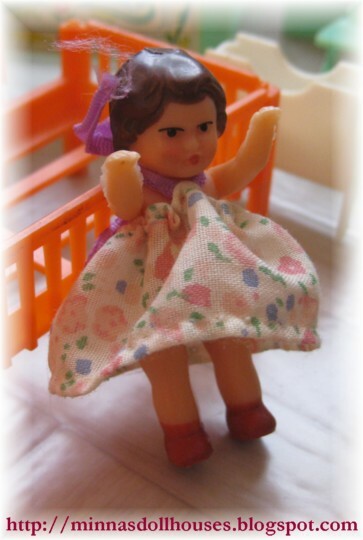 She is only about 5,8 cm tall. Minulla ei ole aikaisemmin ollut näin pientä Ari-nukkea. Se on vain noin 5,8 senttiä pitkä. 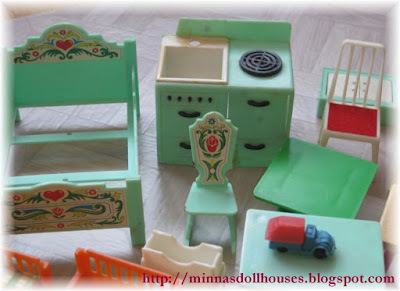 oh my goodness- what beautiful furniture! They look like they were well taken care of- what a great co-worker! Lucky you Minna. The vintage Lundby will look great. Very nice indeed. Doll and all. You see good things come to good people. You are very lucky!I have bought some vintage lundbay fornitures on ebay!It is difficult to find them at low cost! I would like also buy a lundbay home but the shipping cost from england to italy is expencive! Wow! What a wonderful collection! They all look brand new! Ihania!! Muistan vieläkin joulun, jolloin sain tuota samaista sarjaa, kun sinulla on nuo vihreät kukkakuvioiset kalusteet... se oli joulu, jolloin joulupukilla olikin isän aamutossut.. hmmm..
Que maravillosa coleccion, eres muy afortunada. La muñequita es una maravilla. wow - great items! I love that wardrobe! Hej. Fina saker, grattis, men det mesta är dock inte från Lundby. Byrån och garderoben är av märket "Jean" och Våningssängen är "Plastic fantastic". De passar dock rätt bra i ett Lundbyskåp. Lundby hade nästan inga plastmöbler förr. Det är bara på senare år som de börjat med plast. Förr var det bara vissa tillbehör som var av plast. Thank you for the valuable information Lil; I have not heard about "Jean" or "Plastic Fantastic" before. 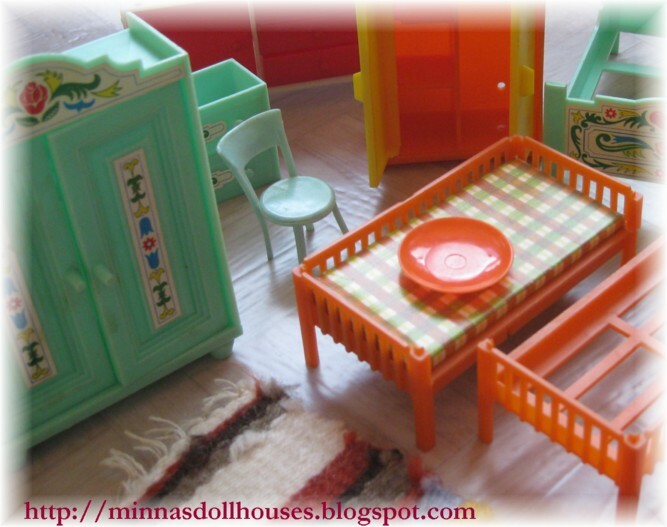 I understood that all of the furniture aren't from the same manufacturer, but I bundled them all as "Lundby", because they were from my colleague's daughter's old Lundby house. ¡Que estupendos regalos! Desde luego puedes empezar a amueblar la casa. La muñequita tan pequeña es monísisma. ¡Cuantas cosas bonitas! Claro que tienes para empezar a amueblar una casa. La muñequita tan pequeña es ideal. Oi että, aivan ihania. Meilläkin muuten on tuollainen samanlainen vihreä kaappi, mutta se on ollut lähinnä lego- leikeissä mukana.